2018 In Review: As store closures mount up, is there hope left for physical games outlets? Last year turned out to be solid for boxed goods. Merchandise was performing well, hardware - driven by Nintendo's new Switch - had done the business, and last year's Call of Duty was the biggest launch in some time. But there were concerns over 2018's release slate and the expected slowdown in software sales as the console market moved into its fourth year. Furthermore, there were some doubts that Nintendo Switch would maintain its momentum without a major game for the bulk of the year. Those concerns proved legitimate, but even the most cautious of retail pundits wouldn't have predicted the bloodbath that dominated the first half of the year. Toys R Us was the big name closure, and the shockwaves from that took out a slew of UK independents - most notably Grainger Games, which with 400 employees and almost 70 stores, was the UK's second biggest games specialist. Other longstanding UK outlets also fell, including the award-winning Scottish games chain Games Centre and the online firm Gameseek. What's more, other UK stores - such as the online retailer Zavvi - have cut back their support for video games. It all reads negatively, but the reality is that this can happen when a big chain collapses. Confidence in the market is shaken, investment slows down and companies that had a tough spell are forced to shut prematurely. A similar thing happened when Woolworths tumbled into administration in 2009. A truer depiction of the state of the market comes in the form of the two market leading specialists: GAME and GameStop. GameStop is not having a happy time of it right now. The US firm has undergone multiple management changes (and the sad death of its CEO), and it is now up for sale. During October, it delivered strong sales but still reported a $488.6 million loss. This has been the result of a major charge of $557.3 million due to a sustained decline of its share price. But it has seen most of its sales come from lower-margin products, with high-margin goods like pre-owned showing signs of serious decline. GameStop also warned that Christmas sales will be "below expectations" due to a drop in pre-owned, aggressive sales activity and the under-performance of specific titles. That under-performance of specific titles is key. Out of the big games this Christmas a few have done well, namely Red Dead Redemption 2. But a number of typically big-selling physical games (Call of Duty, FIFA, Battlefield and Fallout) have all failed to drive the usual numbers. Some of that is due to the transition towards digital. Although physical still takes the bulk of sales, EA, Ubisoft, Activision and Take-Two are all reporting a faster-than-expected move to downloading. Indeed, publishers are reporting that between 30% and 40% of game sales are now digital. 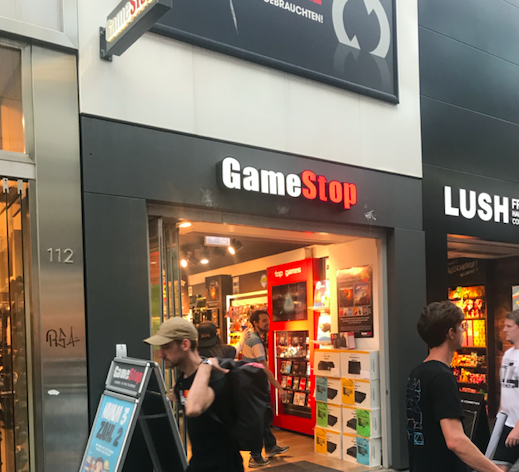 GAME is facing the same challenges as GameStop (specifically a switch to lower-margin goods), and it saw sales declines during its last financial year. However, the UK chain is in a slightly better position due to the investment from retail giant Sports Direct in its Belong in-store concepts - which are local esports style areas where consumers pay-to-play. The company also has very short leases on its stores, allowing it to reduce costs quickly if needed. Belong is still not generating significant revenue for GAME, but the retailer believes it will and that it will define the future of the business. Likewise, GameStop has put a lot of its emphasis behind pop culture, comic books and merchandise - areas that continue to be popular. Yet there's no disguising that sales are down. Profit is down. The transition to digital is marching on. The number of places selling physical video game goods are on the slide. Surely it's a case of when physical games retail falls, not if? Well, the data doesn't especially back that up. The business model is undoubtedly challenged, and when you have shareholders demanding growth there are some serious issues for GAME and GameStop to work out. Yet it's easy to forget what a remarkably physical business video games continues to be. Software is going increasingly digital, but it's still primarily physical - by the end of the year there will be three games to sell more than one million boxed copies each in the UK (FIFA 19, Red Dead Redemption 2 and Call of Duty: Black Ops 4). Over 16.5 million brand new boxed games have been bought over the last 11 months - that's 8% down, but it's still a significant number. Only three weeks ago, a special physical bundle of Fortnite was released - a free-to-play game - and it's already approaching 100,000 copies sold in the UK alone. There's a clear market for physical. Then there's all those millions of SNES Minis and PlayStation Classics, PS4s and Xbox Ones, specialist keyboards, controllers, headsets, Funko Pops, Totaku figurines, trading cards, novelty jumpers, $600 statues and art books. The physical games market is a multi-billion dollar business, and one that is relied upon by hundreds of companies - including Sony, Microsoft and Nintendo. "Transitioning from a primarily software-based business to a hardware, merchandise and event-based business is going to take time and pain"
Mass market retailers and online stores are popular places to buy, but when it comes to effectively selling and marketing physical products nothing beats a specialist. In the UK, when HMV went bust, the music and movie industries collectively saved them. Although digital is dominant, physical was still a very significant amount of money (particularly at Christmas), and those entertainment industries felt it was important to have a specialist on the High Street. In video games the situation is even more acute, with the sheer amount of physical product that consumers want to buy. Of course, it is up to the stores to make themselves relevant. GAME's efforts to become a local competitive hub for gaming is an interesting concept, and the company says that by increasing in-store dwell time it is actually seeing a rise in sales where they have a Belong arena. GameStop's focus on collectibles is working. Merchandise sales were up almost 16% year-on-year for the last quarter. It is still one of the firm's smaller market segments, but it is growing at a decent rate alongside hardware and accessories. Transitioning from a primarily software-based business to a hardware, merchandise and event-based business is going to take time and pain. Yet with the amount of money on the table, it's in the interest of the games business - particularly those at the top - to ensure these specialist stores have the room to make this transition. Games retail had a horrible 2018 and 2019 may be harder still. But physical games retail is not dead. Not even nearly.